Have you ever asked yourself where the dentist chair came from? Over time, this sophisticated equipment has evolved into what it is today – an extremely comfortable sci-fi looking chair with a lot of room for attachments. Old dentist chairs are often confused with those used by barbers, and quite rightly so. The beginnings of dentistry have a lot to do with them. The first people to practice dentistry or dental care were phlebotomy barbers. They would ask their patients to sit on a simple wooden chair to remove their teeth. These days, vintage or antique dentist chairs can be seen in some museums around Europe and North America. While looking at these old chairs, one can probably imagine the patients who yelled in pain while they had their teeth pulled off without anesthesia. One of the earliest known dentists in North America is Josiah Flagg. His first ad appeared in a newspaper in 1790. His centerpiece apparatus was a Windsor chair and an adjustable head rest as well as a couple of arm rests as attachments. 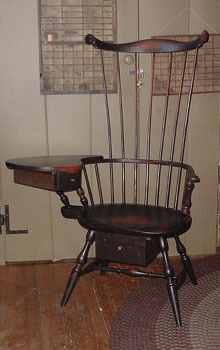 His antique dentist chair, a modified Windsor chair, is now displayed at the Edward and Trudy Weaver Historical Dental Museum in Philadelphia, USA. 40 years later, in 1832, James Snell turned the old Flagg dentist chair into a modern recliner with custom upholstery. In 1848, Milton Waldo Hanchett patented a dental chair he built from scratch. In 1875, a fully reclining dentist chair was produced by the Buffalo Dental Group. It also came with a chair for the dentist, the first of its kind. In 1877, Dr. Basil M. Wilkerson designed the first hydraulic dentist chair. In the 1940’s, the Ritter Dental Company pioneered the design of several dental chairs that allowed tools to be within the dentist’s reach. Appliances were easy to get to and would automatically turn off when returned to their holders. This concept of grouping tools in a single unit was all thanks to Carl Ritter. The dentist chair continues to evolve as demand for convenience continues to grow. Changes in dental practices also make modifications in dental equipment necessary. Tags: antique dentist chair, dental chair, james snell, josiah flagg, vintage dentist chair, windows chair	.